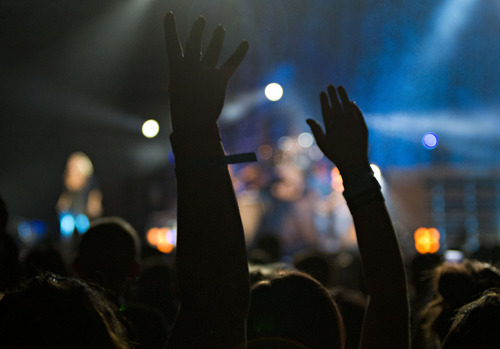 Review • Lovato overcomes personal struggles to connect with Utah audience. 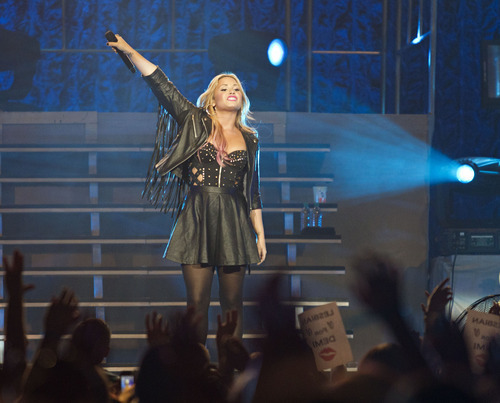 Lennie Mahler | The Salt Lake Tribune Demi Lovato performs at EnergySolutions Arena, Thursday, July 12, 2012. 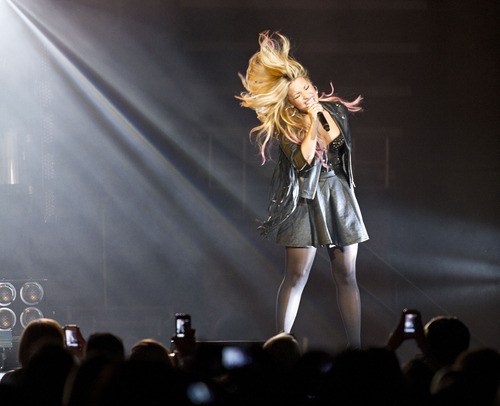 Lennie Mahler | The Salt Lake Tribune Demi Lovato performs at EnergySolutions Arena, Thursday, July 12, 2012. 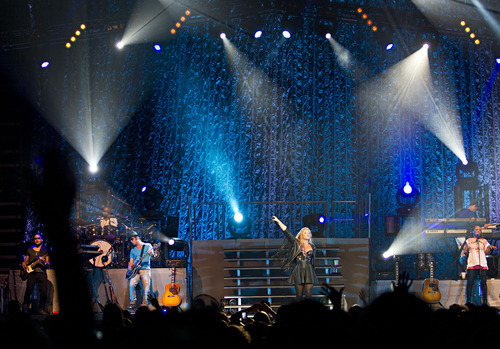 Lennie Mahler | The Salt Lake Tribune Demi Lovato performs at EnergySolutions Arena, Thursday, July 12, 2012. 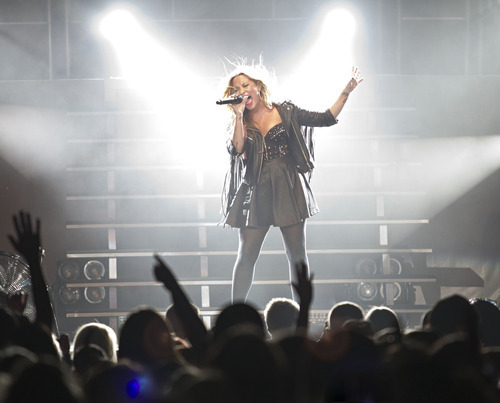 Lennie Mahler | The Salt Lake Tribune Demi Lovato performs at EnergySolutions Arena, Thursday, July 12, 2012. Demi Lovato and Britney Spears will replace Paula Abdul and Nicole Scherzinger as judges in the second season of the FOX singing competition, "The X-Factor," airing this fall. Although she is only 19, Lovato proved Thursday night at EnergySolutions Arena that she is a good judge of her own talent, knowing how to perform and work a crowd into a frenzy. Simply put, Lovato showed that at times she had the X factor. Lovato is often dismissed as yet another teen-aged flavor-of-the-month rolling off the assembly line, destined to follow in the forgotten footsteps of Tiffany and Debbie Gibson. And when Lovato dropped out of a tour in late 2010 to enter rehab for an eating disorder and cutting herself, it seemed as if her career was as good as over, with much of her appeal until then being squeaky clean. But Lovato completed the treatment, and late last year she released her third and best album, "Unbroken," and showed that she was able to make the difficult step from teen queen to an artist with the potential of a long-lasting career  much like Spears. Two of Lovato's songs from the past year  "Skyscraper" and "Give Your Heart a Break"  have become top-20 hits. Wearing a black bustier, black leather jacket, black stockings and black mini-skirt, Lovato demonstrated over the course of a 90-minute, 18-song set that she has one of the most soulful and emotive voices in the pop world  something that separates her from her peers. Along with an amiable personality that endeared herself to the thousands of pre-teens and teens, Lovato also showed that she is a musician, wielding both an acoustic and electric guitar as well as illustrating her skills on the piano. She has a hand in co-writing some of her songs, which can prove that she isn't resigned to letting others fashion her into a pre-set mold. Much of her material was firmly from the girl-power corner, with generally trite messages of not letting broken hearts get you down and how to get up when others have pushed you down. But considering that Lovato has endured a humiliating crucible over the past 18 months, songs such as "Skyscraper" and "Unbroken" carried a special resonance. She seemed invested in the songs. 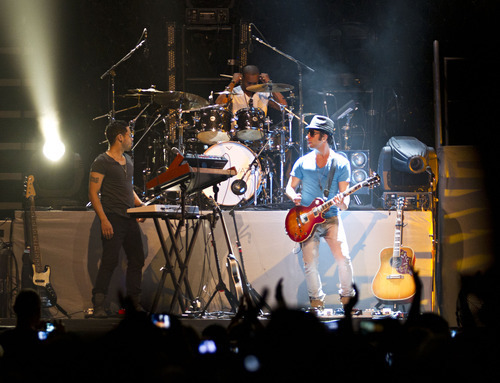 With a spare set consisting largely of lit drapery, Lovato avoided the pitfalls of many pop artists by having a real band (bass, guitar. keyboards and drums) behind her, providing a rhythmic power-pop sound instead of synth-generated backing. She knew the power of dynamics, with a set that showcased slower ballads as well as upbeat covers of Lil Wayne and Chris Brown. Lovato is still a young singer, so she had a tendency to over-sing songs like another singing-show judge, Christina Aguilera. And while I realize I am not her target audience, adults can find the Pollyanna sentiments grating and too pat after a while. But Lovato can sing, and sing well. As a judge, I would send her to the next round.